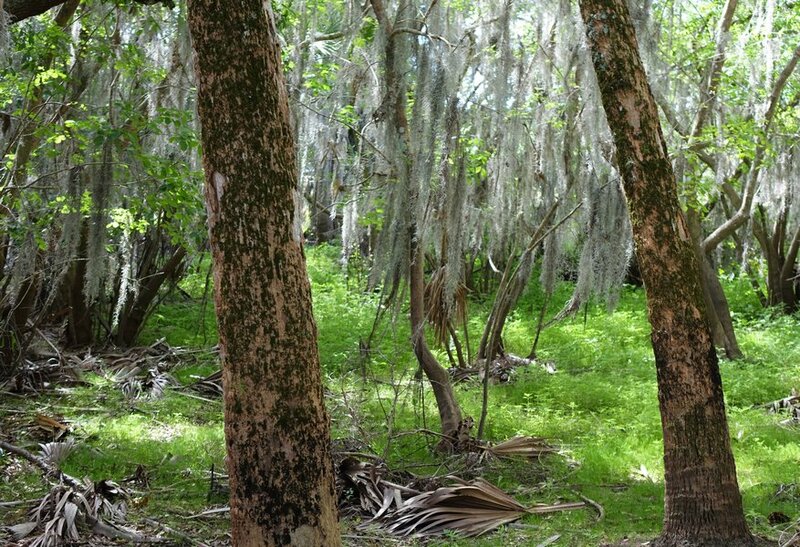 Something that has always puzzled me when I go to Myakka River State Park is that I don't see any rabbits. I've seen them in town. I just haven't seen them at the park. When I set off for the park yesterday, I was not on a quest to locate rabbits. Instead, Freida the Fabulous Fish had been bugging me to take her back to the park to see if any of her "admirers" might still be around with their cameras. As I turned down my favorite road, little did I know that Freida would notice. "Why did you turn here? Why are you wasting my time? Why are you wasting my ADMIRERS' time? QUICK! TURN AROUND!" she shouted. "We'll only be a few minutes. 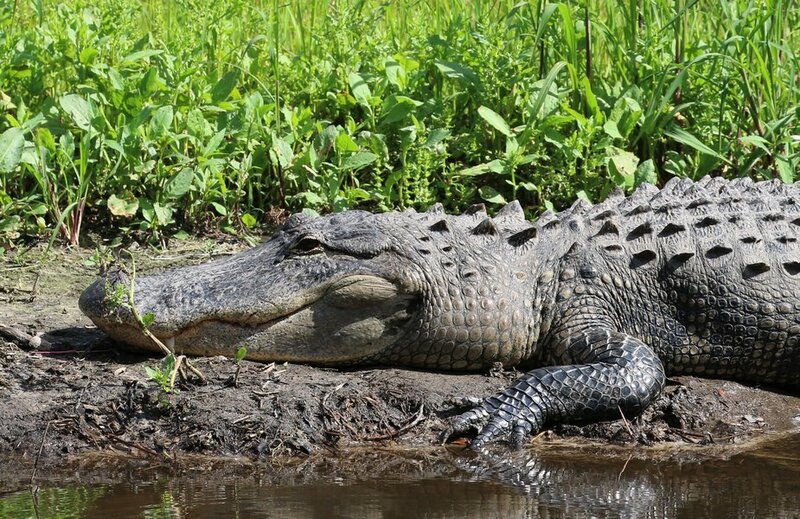 I want to get a few quick pictures of the river and to check if any of the alligators might be out and about. Then we'll be on our way." I replied. Reluctantly Freida acquiesced, I quickly parked the car and to the river we hurried with Freida putting in her two cents with everything that didn't meet her discerning sparkly tastes. Before long I noticed she became way too quiet. When I turned around to see what had gotten her notice, lo and behold there were two demure slightly-sparkly rabbits observing our approach. "Rabbits! Who would have thought we would have seen rabbits!" I excitedly said to Freida. "I don't know why you're making all this fuss. They're just rabbits and they're not even as sparkily stunning as I am," harrumphed Freida. As we continued to approach the sparkly duo, one leaned over to confer quietly with the other. "Hmmmmm. Did Freida offend them with her snide remark?" I wondered. "I hope they're not planning anything to get back at us." I added. 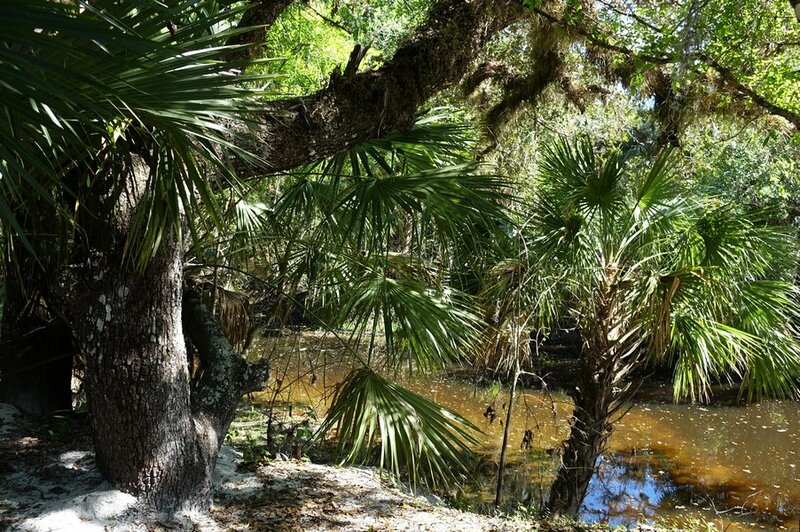 Before I could continue agonizing over what may or may not be afoot, Freida and I reached the river and the glorious beauty of the Myakka River did something that I didn't think was possible. Freida was left speechless! In fact Freida was enchanted by the natural beauty before her. "Hurry, Freida. We have to get out of here. You can check out the river somewhere AWAY from those rabbits. I don't trust them. Come on! Let's go!" I chided. With one exasperated breath, Freida complied and down the trail we went. 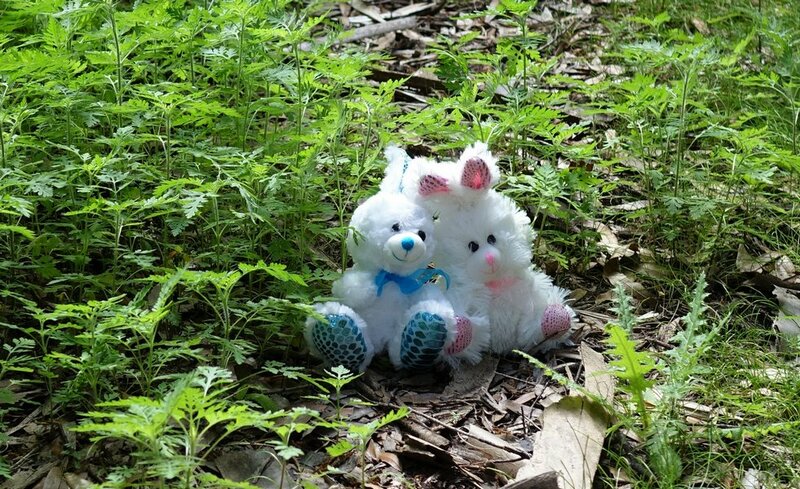 Quickly into the woods we scurried and before long the strange sparkly bunnies were a distant memory. "WOW! Look at that tree up ahead!" suddenly shouted Freida. "It's a MAGICAL TREE...an ENCHANTED TREE...a BEWITCHING TREE!" continued Freida. "What on earth are you talking about?" I questioned. "It's just a gnarled old tree." I added. "No, no, look again. There's a manatee on the right and above is a serpent slithering down the trunk. You can see its head and, and, oh no, THE RABBITS!" shouted Freida. "I must sneak up to see what they're plotting," Freida said. 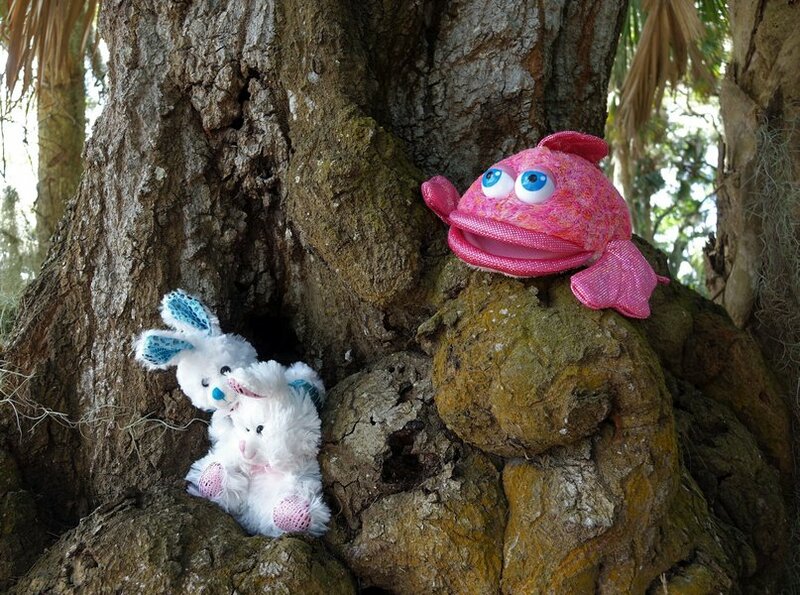 Before I could stop her, Freida the Fabulous Fish was gone and in a blink of an eye, above the rabbits she suddenly appeared, listening intently and spying as only a pink sparkly fish can spy. Then before I knew it, they all were gone! "What happened? Where is Freida? Did they push her in the river? FREIDA! FREIDA! FREIDA!" I shouted. "Did the alligator think she was too enticing to resist?" I worried. Just then I heard some commotion behind me, commotion from the emerald green forest. "Hey! Hey!! Come over here!! Quick!" it yelled. Puzzled, I didn't know what to do, in what direction to look. "Do I look around the river? Or In the woods as the voice commands?" I wondered out loud. Before I made my decision, magically the rabbits once more appeared. "You must follow us," they commanded. "We will take you to your friend, the sparkly one," they added in unison. 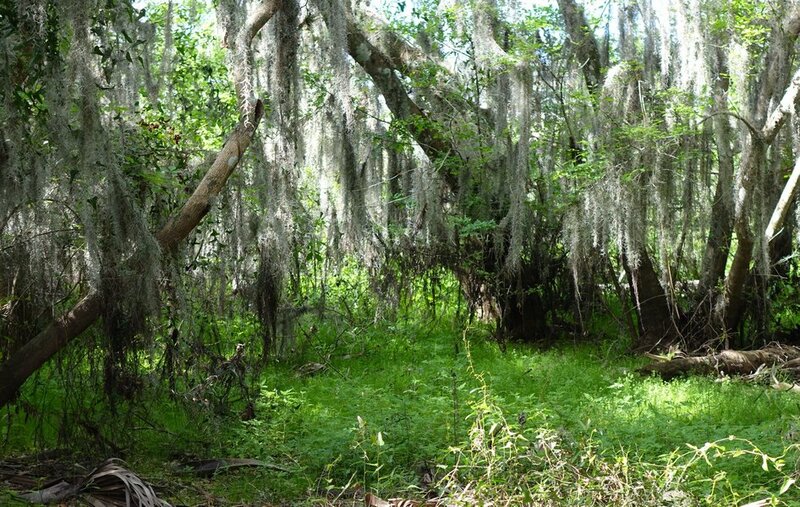 "She has acquired the keys to the Magic Kingdom of the Myakka and is about to use them. Hurry! Before it's too late!" they both pleaded with me. Having no choice, off I went, following two semi-sparkly rabbits who were quickly sailing over downed limbs while I was left "hopping" over tree stump after tree stump until finally I landed in a rather undignified fashion on a little-used beach along the Myakka River, and there was Freida the Fabulous Fish, readying herself for a swim among the Myakka alligators. "You have got to be kidding me! I have been looking all over for you! What are you doing here?" I asked. "And why are you wearing that goofy visor?" I continued. 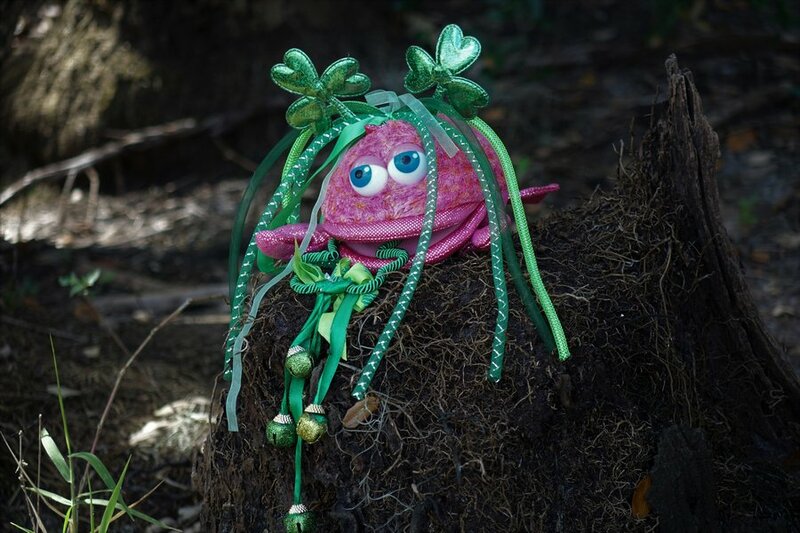 "Why this is a magical charm that I acquired at the enchanted tree," answered Freida. "No harm can befall me if I encircle my head with its powerful mystical magical sparkly aura!" argued Freida. "I will be able to swim among the alligators and they will never even know that I am there!" continued Freida. "They will if you're wearing it BACKWARDS!" I argued. 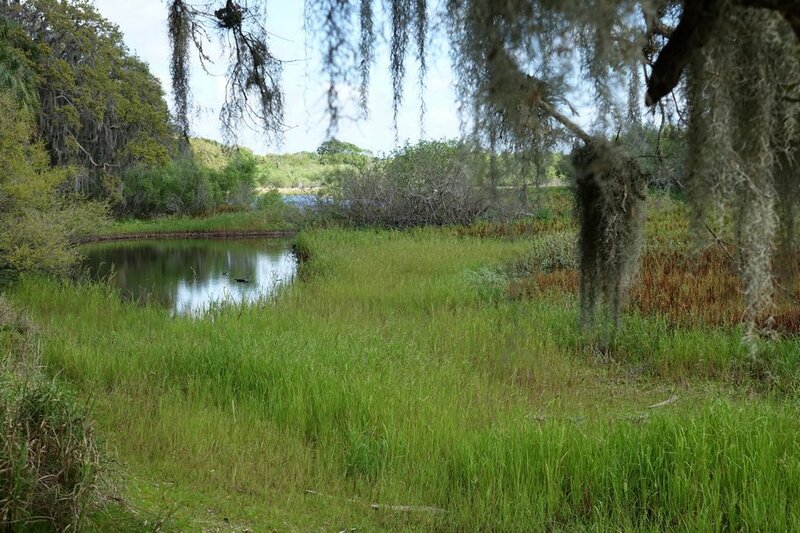 "What's this about having a KEY to the Magical Myakka River? I don't even see a key in your goofy attire?" I commented. "If you don't have a key, how can you ensure your ....?" Before I could finish my thought, Freida the Fabulous Fish took one magnificent sparkly somersault and lo and behold, her queenly attire was complete! 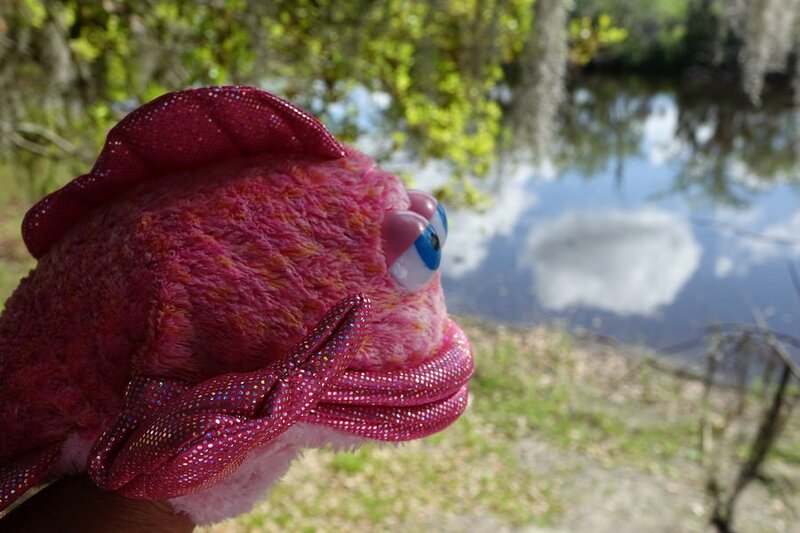 Freida the Fabulous Fish now had her aura of protection correctly positioned on her crown and last but not least, there in her mouth was the key to the Magic Kingdom of the Myakka River. "I can see you must have found some very nice magical charms, Freida. Too bad they won't be effective protecting your gorgeous sparkily neon pink. Well, at least the semi-sparkly rabbits can...."
WHOOOOOOOOSH! I never saw Freida move so fast. No, she didn't move towards the river to test out her Magical Key. No, this was a fish on a mission. Freida the Fabulous Fish was destined for stardom! Freida had sparkles to protect. There would be no swimming today. After all, Freida the Fabulous Fish had admirers awaiting. It's always good to be receptive to learning, to listen to other points of view, and to perhaps reinforce or modify one's positions. With that in mind, Freida the Fabulous Fish has some "truisms" to pass along. Biting off more than one can chew can be an uncomfortable feeling. Going out on a limb is a stunt best left to the acrobats. Of course, Luisa and Ethel had their own wisdom to share. One must listen to learn. Other Myakka friends offered their tidbits as well. One should always be prepared for what comes one's way. Being a good conversationlist can save the day. Wherever your paths may lead you or whatever currents you may ford in life, may they always bring you "home" to a feeling of well-being within your soul. Although we live in a community where a "No Soliciting" sign is posted, it didn't stop a rather glitzy visitor from knocking on our door Saturday morning to solicit a ride to Myakka River State Park. Now generally I'm not so accommodating but for some unexplained reason, Freida the Fabulous Fish from Vegas took me by surprise. 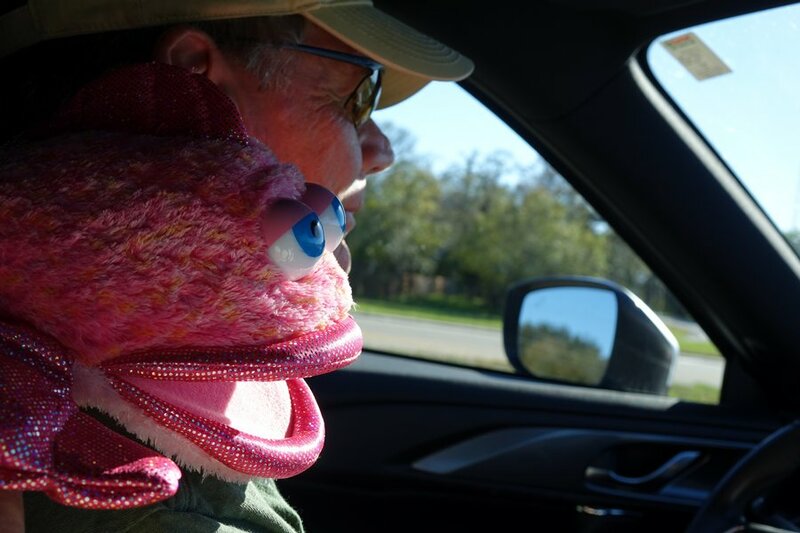 Whether it was her glitz or her charm, I don't know but within seconds, Freida the Fabulous Fish was not only in our car, but we were headed to Myakka. Naturally she was in the front seat helping Larry drive! Fortunately Larry didn't listen to any of Freida's advice. Normally when we go to the park, we hike along the Myakka River but Freida looked too tempting for the alligators to resist. Instead, we decided to check out the CLAY GULLY PICNIC AREA. Although the area was posted for a possible alligator, we thought she might be safer here. At first Freida the Fabulous Fish was eager to check out her surroundings. "Freida, this is a good place for you to swim. Just let go, jump in, and make some friends," I suggested. "You can do it, Freida. Those are all nice friendly Florida fish below you," Larry encouraged. 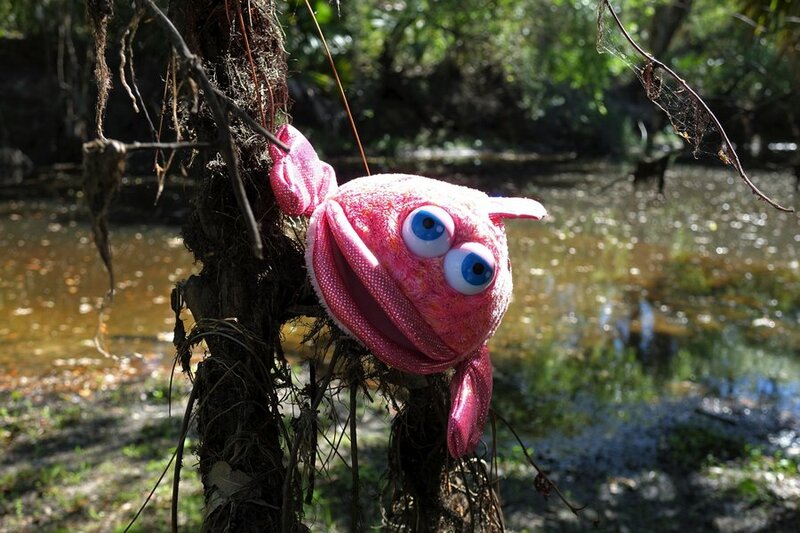 Well, Freida the Fabulous Fish scanned the waters downstream.... "Are you for REAL?? There is NO WAY one would ruin a palette as lovely and magnificent as mine!" she yelled. "This is not working, Larry. Maybe we should have found a less rustic place for Freida to enjoy," I suggested. "Yea, she looks depressed. Freida is definitely not the "woodsy" type," said Larry. "There are lots of places in the park. We'll drive and let Freida decide where she'd like to stop," added Larry. "STOP! STOP!!! STOP!!!!! There it is!! I want to go THERE!!!" screeched Freida at the top of her lungs. "This is IT! I can feel it! This is ABSOLUTELY made for me! STOP!" she screamed. 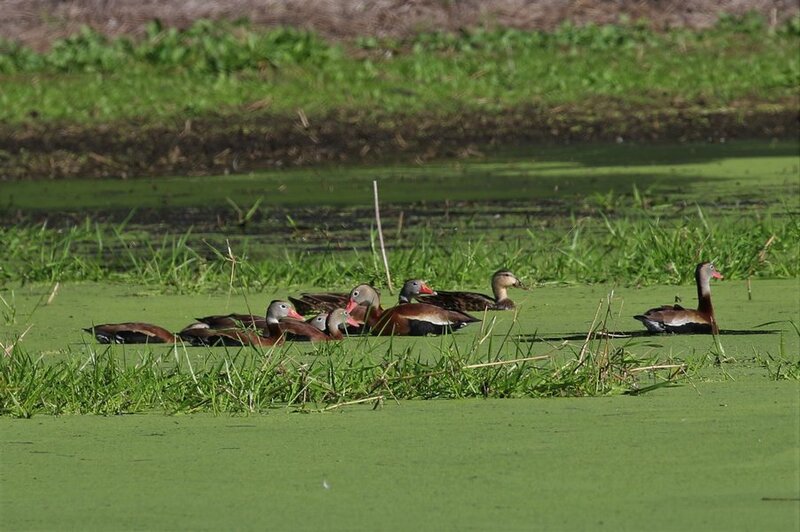 "BLACK BELLIED WHISTLING DUCKS! They're pretty...they're not so much glitzy...but they ARE quite lovely... Hmmmmmm... Sure are A LOT OF them! Hmmmmmmm.... They're all over the field.... Do glitzy pink fabulous fish like to hang out with orange-beaked whistling ducks?" I wondered. 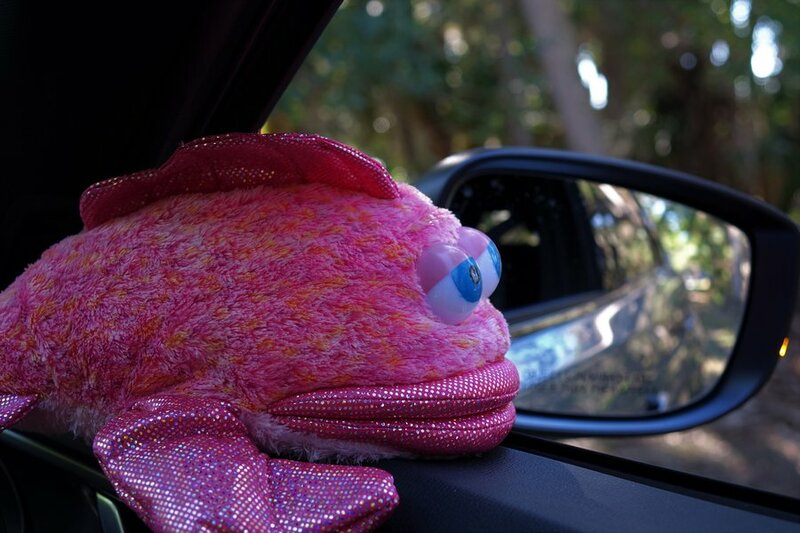 As Larry prepared to find a safer parking spot so that Freida the Fabulous Fish could better avail herself of a glitzy touristy opportunity worthy of what someone of her glamour status might expect, suddenly Freida shouted out, "NO, NOT HERE!!! UP THERE!!! ACROSS THE ROAD!!! IN THE FIELD!!! QUICK!!! HURRY...BEFORE WE'RE TOO LATE!!!!" Perplexed, Larry and I looked away from the birds, across the road, and in the direction to where Freida the Fabulous Fish was pointing. Ahhhh.... CAMERAS! Lots and LOTS of cameras!! Cameras mounted on tripods, cameras awaiting the right moment, cameras in a direct line, cameras in line with the whistling ducks.